Item # 311600 Stash Points: 1,995 (?) This is the number of points you get in The Zumiez Stash for purchasing this item. Stash points are redeemable for exclusive rewards only available to Zumiez Stash members. To redeem your points check out the rewards catalog on thestash.zumiez.com. 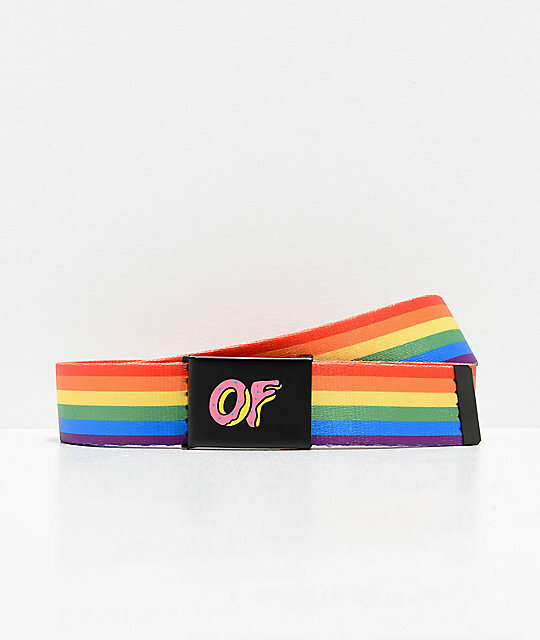 Add some color to your streetwear collection with the Rainbow Web Belt from Odd Future. This web belt features rainbow colored horizontal stripes throughout, and a metal belt buckle displaying an Odd Future donut logo, creating a fun and lighthearted design. Rainbow Web Belt from Odd Future. Rainbow horizontal stripes throughout nylon webbed belt. Metal buckle with Odd Future logo & anti-fray end piece.